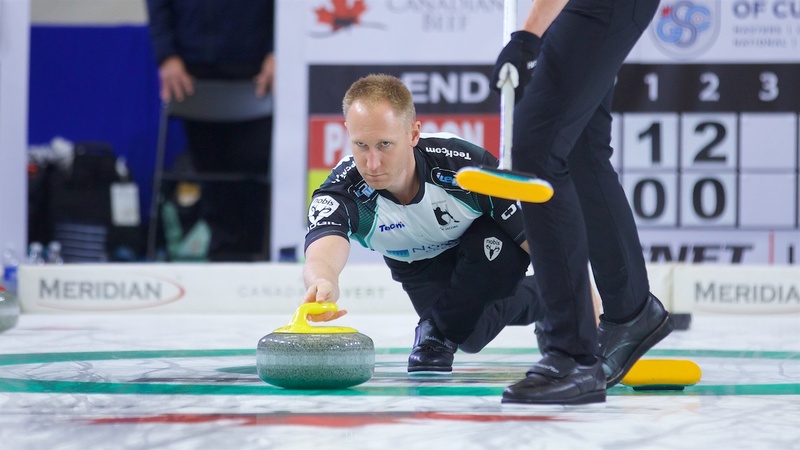 ESTEVAN, Sask -- Brad Jacobs executed two nearly perfect draws in the fifth and seventh ends to break open a tight battle between two Olympic gold medal winners and take an 8-4 win over Brad Gushue in the second draw of the Home Hardware Canada Cup Wednesday. The win moved Jacobs and his Sault Ste. Marie, Ont., team with substitute vice-skip Marc Kennedy, second E.J. Harnden, lead Ryan Harnden and coach Adam Kingsbury, to 2-0. "Couldn't ask for a better start," said Jacobs, who scored two in the fifth and three in the seventh. "Marc made a great freeze on his last one (in the seventh) and mine, even though it wasn't a perfect shot, it was good enough that when Brad played his last, our two kind of just stuffed and stuck in there and we were laying two. We had an open draw for three, had to go out a little wider into a fresh spot, but thankfully I threw it a little heavy hoping it would come down and it did." Kennedy is playing third this week in place of Ryan Fry who is taking a break for personal reasons. Reigning Tim Hortons Brier champion Gushue, backed by third Mark Nichols, second Brett Gallant, lead Geoff Walker and coach Jules Owchar, dropped to 1-1. The 2006 Olympic champion didn't feel his team got a lot set up the way they wanted even before the fifth and seventh ends transpired. "We struggled with the set of rocks we had," Gushue said. "We didn't do as good a job as we normally do in getting four good sets. I think all of us had one rock that was a little different from the others." Jacobs, the 2014 Olympic gold medallist, got off to a good start by stealing singles in the first and third ends. In the fourth Kennedy missed on a tight take-out attempt and Jacobs was narrow trying a difficult double, creating the chance for Gushue to score a game-tying deuce. "He made a great shot in four," Gushue said of Jacobs' final stone. "It looked like we were going to score three, but he rolled buried. I made a pretty good one for two but if I curl another inch, we get three. But I thought I would have a lot easier shot than I had but he made a great one." Jacobs redeemed himself in the fifth with a delicate draw to the edge of the button to score two of his own and regain the two-point lead. He followed that up with another perfect draw to the side of the button to score three in the seventh and take control of the game. In the other men's afternoon game John Epping (2-0) of Toronto beat Reid Carruthers of Winnipeg (0-1) 6-3. On the women's side, Rachel Homan (1-0) of Ottawa stole singles in four ends but still needed to score one in the 11th end to subdue Kerri Einarson (0-1) of Gimli, Man., 6-5; Jennifer Jones (1-0) of Winnipeg scored a deuce in the extra end for a 7-5 victory over Chelsea Carey (0-2) of Calgary and Casey Scheidegger (1-0) of Lethbridge, Alta., beat Laura Walker (0-2) of Edmonton 6-3. The 2018 Home Hardware Canada Cup continues with the evening draw at 7 p.m. CST. The Home Hardware Canada Cup format calls for the men's and women's teams to play a three-day round robin, with the first-place teams advancing to their respective finals on Sunday, while the second- and third-place teams meet in semifinals on Saturday, after any required tiebreakers, to determine the other finalists.